And in the third part, how organizations go about putting agile to work. She summarises the mind-set and practice shifts as five agility shift dynamics. Relevant – Meyer agrees with Simon Sinek: start with why. The alignment of values and purpose empowers employees to take initiative within purpose. She leads us from SWOT and shows what’s missing, taking us to SOAR – strengths, opportunities, aspirations, results. SOAR is what fuels innovation. Responsive – agile organizations must respond quickly to emerging opportunities and the unexpected in order to resolve an emerging situation and/or, positively respond to an opportunity. A responsive organization makes optimal use of available resources. When you empower employees at all levels to respond immediately within their span of control you create a responsive, agile organization. Resilient – agile teams are able to regroup, reorganize and renew in response to significant disruption. They have the ability to bounce back and an attitude of optimism and hope. You create resilience by cross training understudies to keep the show on the road and preparing for what if scenarios with response, recovery and restoration plans. Resourceful – they use and improvise with all available resources. Unlimited resources detract from key opportunities. Reflective – are able to learn from experience. They ask themselves the challenging questions, with an attitude of curiosity: What has happened? What can we learn? How can we incorporate new learning? Point 2 – Responsive – resonates well with me and my research and consulting with International clients over the years. I equate leadership in an agile structure as being like a DJ, balancing the boundaries of the organisation, responding to the needs and external influences. Every organization has to maintain a dynamic balance between open and closed boundaries to serve their purpose at different times. The book gives an overview of what the author thinks is necessary to create an agile organisation. Unfortunately she doesn’t tell us a lot about how to do it. 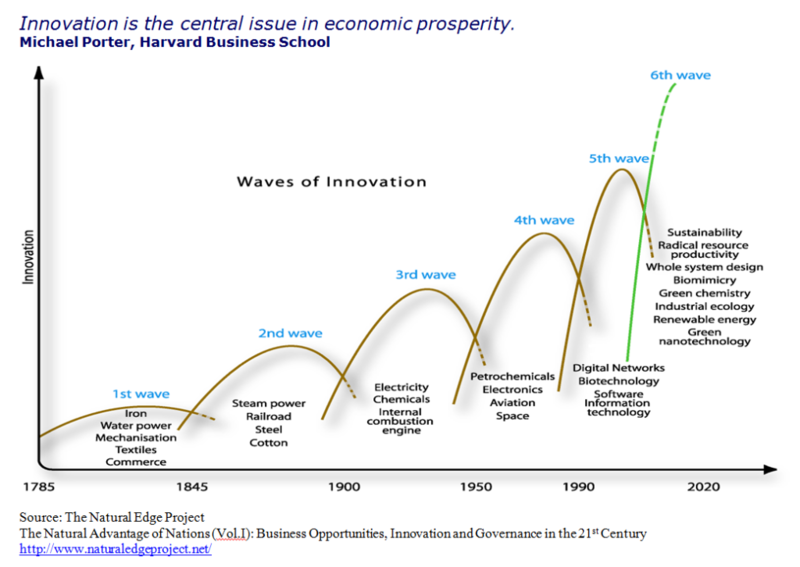 My favorite chart is the waves of innovation – we have come so far in so short a time. Now we need to find ways of making progress in a sustainable way. What kind of processes does your organisation have in place to learn from experiences with customers?